The daily drudge of frontier life. In the1840’s it was the inherent right of people to travel from the thriving American Eastern Seaboard to the new Western frontier with a promise of a new and good life. This became known as the Oregon Trail it was a 2000 mile journey that could take between four and six months. These pioneers travelled with their families and there goods and chattels, some made it across the barren dry landscape and some perished on the journey. Kelly Reichardt (Old Joy 2006) has based her western road movie Meeks Cutoff (2010) on the true story of the fur trapper and guide Stephen Meek (Bruce Greenwood), who due to the risk of Indian attacks left the Oregon Trail declaring that he knew a short cut that would avoid the threatened hostilities and get to the destination a lot sooner! Leading three families on an unmarked path across the high plain desert, he soon becomes lost. Fighting hunger and thirst they had to increase their reliance on each other and when a Native American crosses their path the emigrants are torn between their lack of trust in Meek, who has certainly proven himself to be unreliable, and the Cayuse tribesman (Rod Rondeaux) who is perceived to have an interrogate knowledge of the terrain but is seen as a savage and their natural enemy. The Women become the dominant force. The film quite vividly demonstrates how the masculine powerbase soon disintegrates when things get really tough and how the “women folk” become the dominant force. 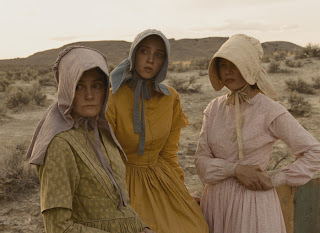 Michelle Williams plays Emily Tetherow the most resolute of the travellers who along with the two other female members of the party, played by the Scottish actress Shirley Henderson and Zoe Kazan, become the central individuals in this ever more deteriorating situation. The authenticity of the untamed frontier is greatly enhanced by the splendid cinematography of Chris Blauvelt. As is the story by some genuinely good acting from all our nine leads that indisputably portray the genuine pain and anguish suffered by these early settlers. And what a great ending, one that credits its audience with some intelligence.